There are plenty of ways to fulfill your New Year’s resolution to be healthier in 2018. Get out of the house and take the pups for a walk at the Fred Quinn Happy Tails Dog Park or head over to Lake Stanley Draper for a day of hiking with the family. Lions Park offers playground equipment and a skate park for the kids! ​You can find us getting fit at Yoga in the Library each Wednesday from 7-8 p.m. at the Midwest City Library. Yoga is perfect to get into the rhythm of working out– don’t worry about being flexible or strong enough, this class is for all levels of experience. After a long day it’s the perfect way to unwind and enjoy some “me time” without the distractions of a regular workout environment. Grab a mat and join us! If yoga isn’t for you, try one of the classes offered at 10GYM, Shape Fitness or Planet Fitness. 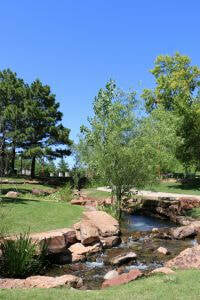 You can even swing a club at Hidden Creek Family Golf Course or John Conrad Golf Course. There are plenty of ways to get active and be healthier in Midwest City, check out more of our favorites here.